The Panama City Beach Chamber of Commerce will host its IdeaCamp on Wednesday, April 25, from 5:00PM until 7:15PM on the Island Time Sailing Cruise, located at 3605 Thomas Dr. This is a LIMITED seating event you will not want to miss. The first 50 who register will be in attendance. 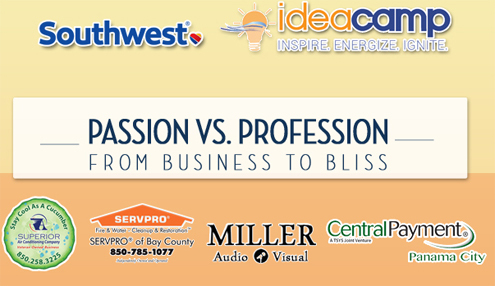 This IdeaCamp will be presented by Southwest Airlines and sponsored by A Superior Air Conditioning Company, Servpro of Bay County, Central Payment of Panama City, and Miller Audio-Visual. Guest Speaker David Balmer will be speaking on the topic, “Passion vs. Profession-from Business to Bliss.” Join this relaxed networking event for hors d’oeuvres, cocktails, and the opportunity to hear people share their own wisdom, stories, and tips for business success. At 50-feet long and 30-feet wide, The Island Time has been the premier sailing catamaran in Panama City Beach since 1999. The proud and dedicated crew and staff of the “Island Time” have been with the company for years and are always excited to show off their beautiful natural resources. On their cruises you will enjoy a relaxing and fun sailing cruise with great music and a wonderful crew to make sure you have a great time.